Big Data Hadoop is widely acclimated by companies these days and with average 50+ nodes cluster and 100+ TB storage used in most of the enterprises there are huge number of errors and issues faced by Big Data Consulting Company India and Admins every single day. 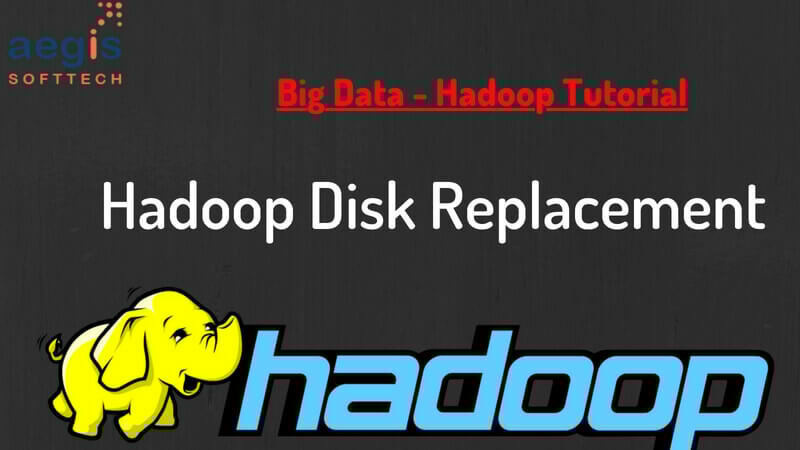 One of the utmost typical and toughest errors faced by them is disk related issues where there is no option left but to replace the disk where Hadoop data is stored and this faulty Disk is needed to be replaced by a new one. Disk replacement activity in Big Data Hadoop mostly involves a worker/datanode going down/showing bad health due to one of the disk failed for that particular node. Please note that this applies to all the distributions used for Hadoop e.g. Apache, Cloudera, Hortonworks, MapR, IBM, AWS etc. The Hadoop solution here is to perform Pre Disk Replacement tasks for Hadoop worker node to ensure data should not be corrupted/lost, while/post disk replacement. NOTE: - Disk Replacement steps also depends on Disk Raid level. For Disk using Raid 1/10 we can do Hot Swap. For illustration purpose we have used Cloudera Manager as a Monitoring tool which should be taken as a reference for other monitoring tools too. 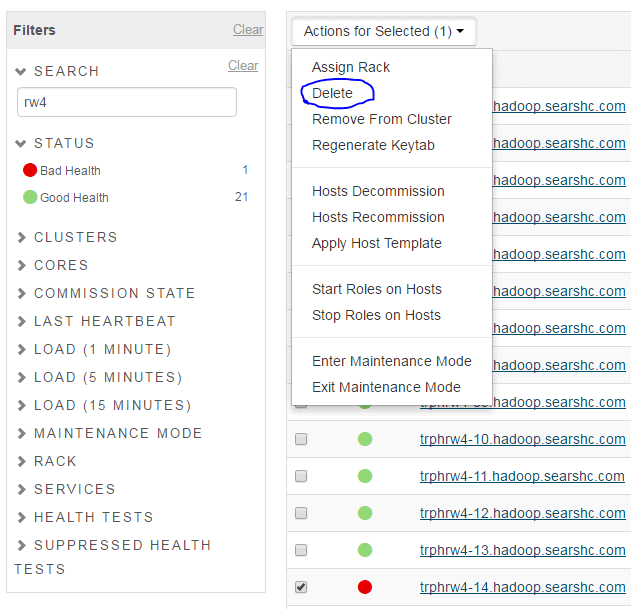 Login to Access Node of Hadoop Cluster. Ssh to corresponding Hadoop datanode/worker node for production/integration environment Where disk issue is rectified. Netboot enable server so it will rebuild on reboot. 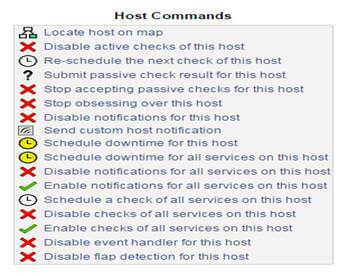 (optional: if Nagios is Used) Disable Nagios alerts for host. 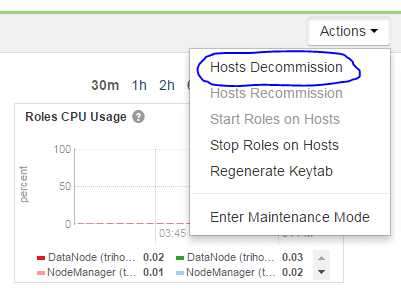 If host is not already decommissioned in Cloudera Manager (or any other Monitoring tool), decommission it now. Decommission can take 10-20 minutes depending on how many blocks needs to be replicated from this host to others in the cluster. Swap bad disk with good disk. Power on server and ensure PXE boot so it boots from the network and rebuilds. (optional: if cobbler is installed) Check rebuild status. Cobbler status | grep hostname) (rebuilding will take 20-25 Min. 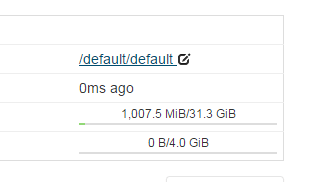 Ssh to host once rebuild is complete. df command to verify file systems. Check /var/log/messages for any errors related to recently replaced disk. Could be sign of other issues besides a bad disk. a. Will need to decommission host if not already done. Search for the host after clicking continue. 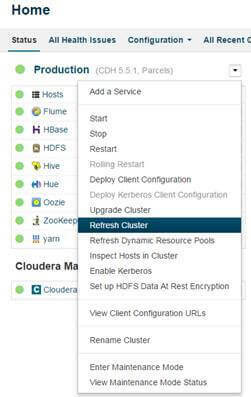 Select “Matched release for this Cloudera Manager Server” and continue. Select both JDK and Unlimited Strength Encryption Policy Files and continue. (Optional) Use the root password or get the private key from host and continue. Wait for installation to complete and continue. Wait for parcels to be installed and continue. Ensure no errors from host inspector and continue. 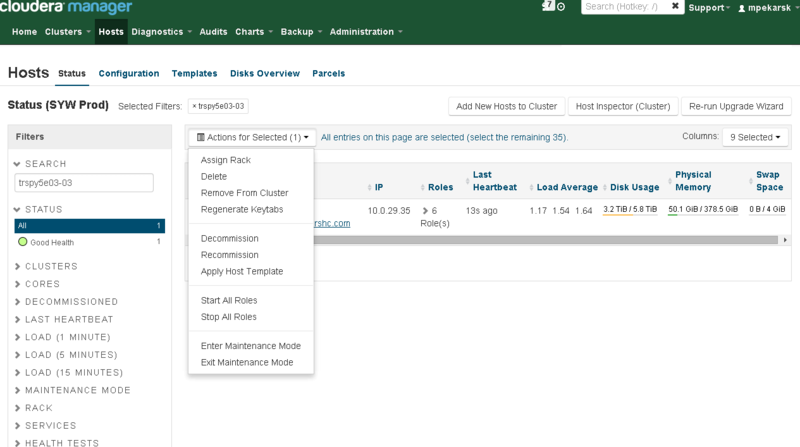 On the newly added host page change the rack name to match the rest of the servers in the same rack. Enable notifications for host in Nagios using same process/steps mentioned above used to disable. 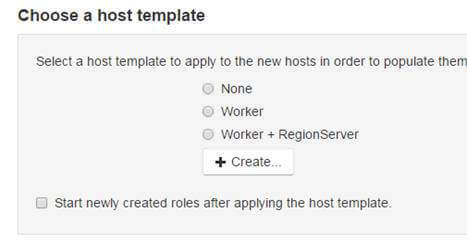 Start all roles on the host. Determine which vdisk corresponds to pdisk that is being replaced. Change vdisk number until the output of below command shows the correct pdisk. Blink the lights on the outside of the disk, so Linux team can easily identify correct disk. Disks are in raid controller, therefore hot swap, no need to power down server. Make sure new disk is good. Create a new primary partition that uses all of the available space on the disk. Delete any currently existing partitions. Create a new filesystem on the disk and disable checking of the filesystem. Get UUID for new disk. Edit fstab and replace old UUID with new UUID from above command.